What’s going on? 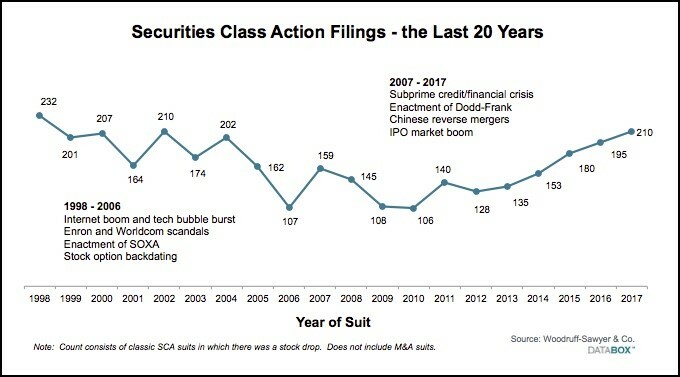 Securities class action lawsuits are up again in 2017—surpassing the year prior with 210 suits filed versus 195 in 2016 (which was itself a 10-year high). In fact, 2017 saw the second-highest number of securities class action suits filed in the last 20 years. At Woodruff Sawyer we dug into our proprietary D&O DataBox™ to examine why the securities class action landscape is so frothy. As a reminder, when we count securities class action suits we are specifically counting suits against issuers of common or preferred stock listed in the United States. 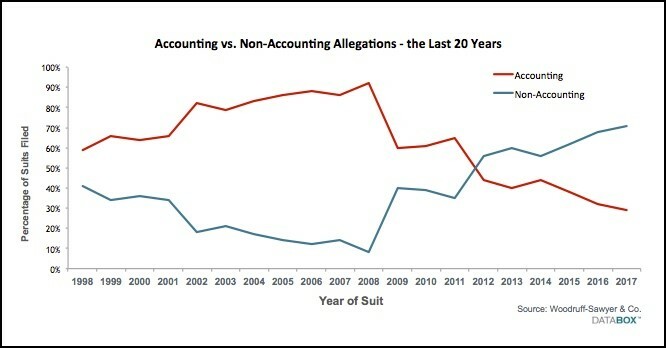 One observation is that we’ve seen a dramatic shift from the traditional accounting allegations to non-accounting cases in the past 10 years, such as missed earnings and news-driven events (think product safety issues or cybersecurity as examples). We’ve talked about cybersecurity in the context of D&O litigation in the past, and it’s very clear that the plaintiff’s bar is not giving up on its efforts there. A news-driven event that has dominated the headlines in much of 2017 is the emergence of a multitude of sexual harassment claims across many industries. While workplace liabilities have always been a concern for companies, it has now filtered into the securities class action arena. We see the case against Signet Jewelers as the potential canary in the coalmine. Sexual harassment may no longer be a human resources issue, but a board-level issue. We are also seeing a sizeable increase in filings against foreign issuers listed in the United States. 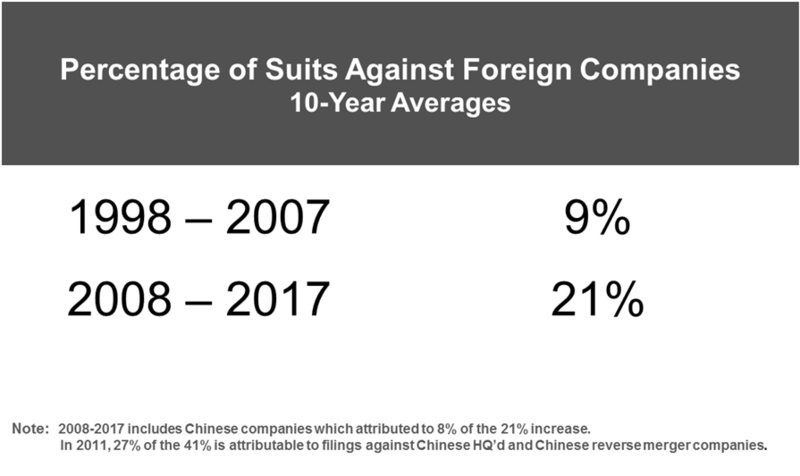 In 2017, nearly one-quarter (24 percent) of securities class actions filed were against foreign issuers. You can see from the data that the volume of cases against foreign filers has gone up over time. This is certainly contributing to the overall increase in securities class actions lawsuits. What is happening with these cases? Given how long securities class actions normally take to settle, we really cannot say much about the cases filed more recently. However, we continue to observe that almost nothing goes to trial. 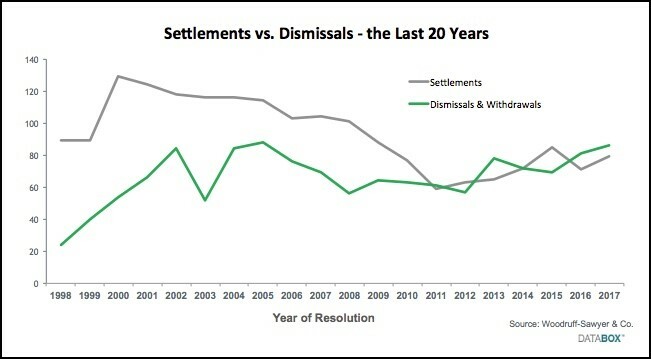 More interesting is the fact that we are seeing fewer settlements and more dismissals and withdrawals. This might say something about the quality of cases being brought by plaintiffs. We are not the first to observe that the quality of securities class action cases has been declining. A similar conclusion was reached by Michael Klausner, Professor of Law, at Stanford Law School, and Jason Hegland, Executive Director, Stanford Securities Litigation Analytics in their analysis of class action filings from 2006-2015. The problem with frivolous cases is that they are still expensive for issuers and distracting for management. Our observation based on the suits we’ve seen filed in 2016 and 2017 is that the plaintiff bar’s general willingness to file low-quality suits in the absence of legitimate cases persists. Perhaps this is due to the turnover in the leadership of the plaintiff’s bar from 1998 to 2007 versus 2008 through 2017. While few in the defense bar are particularly waxing nostalgic for the “good old days,” known firms had the virtue of being predictable. New entrants to the plaintiff bar have been less so. 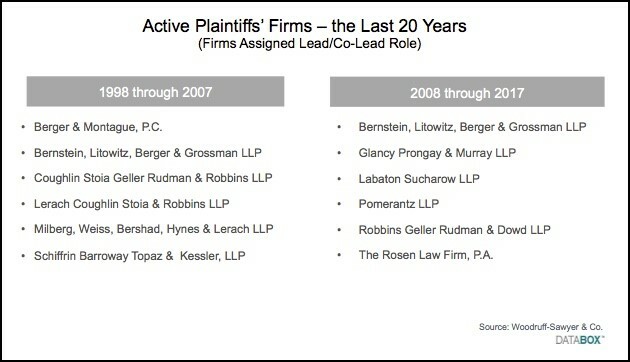 As you can see from the chart below, while some individual players may be the same, many of the law firms are not. So why are the numbers of securities class action law suits up? It’s certainly not because we have more public companies than we used to have. According to JP Morgan, there were 8025 public companies in 1996, and only 4333 by the middle of June 2016. In other words, the frequency rate of securities class action suits is definitely up. When we review the data we don’t see any one mega trend that explains the situation. Instead, there are a number of smaller trends converging into one raging river of securities class actions lawsuits. Woodruff Sawyer will be watching these trends closely and reporting on any new insights we uncover. Interested in more on this topic? My partner Denise Amantea will be speaking at the upcoming Professional Liability Underwriting Society’s (PLUS) D&O Symposium in New York on January 31 and February 1, 2018. 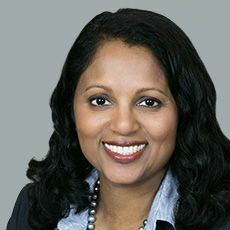 Her panel’s topic is “Disruptive Dynamics & Higher Filing Rates.” These are big issues for the D&O insurance community. Not going to be in New York in the dead of winter? Clients of Woodruff Sawyer are always welcome to contact their Account Executive to arrange for an in-person briefing, including for their boards of directors.